This material is a fine powder composed of tungsten carbide particles of approximately 80nm diameters, hexagonal in structure. Acid-resistant, insoluble in cold water, and possessing a high elastic modulus, tungsten carbide nanoparticles are useful for generally resilient coatings, composites, and similar applications. Alloys. Due to the inherent hardness of this material, its an ideal component for creating various super fine hard alloys. It’s also of value in producing certain alloys of tungsten. 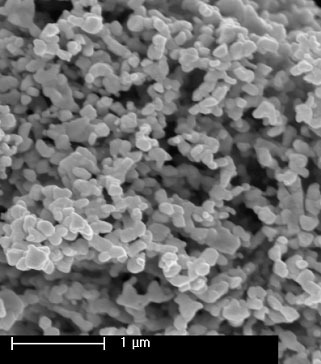 Nanocomposites. The properties of this material make it valuable in producing certain nanocomposites, particularly those which need to be exceptionally wear-resistant. Abrasion-resistant. Materials with a need for abrasion-resistance can be enhanced with tungsten carbide nanoparticles as either a component material for a composite or as part of an abrasion-resistant spray. Wear resistant. The hardness of this material makes it ideal for producing wear-resistant composite materials and coatings. Tools. Various tools which need to be chip-resistant or wear-resistant can be produced using tungsten carbide as a coating or material component, etc. In particular, this material is widely used in the manufacture of mining equipment. Corrosion-resistant coatings. In addition to value in wear and abrasion resistance, tungsten carbide nanoparticles can also be used to produce corrosion-resistant coatings. To inquire about available particle sizes, purities, structures, and other configurations, call SSNano today.